Our recycled rubber bracelets support four organizations aiding women and children in Africa. MADE WITH LOVE BRACELETS from AFRICA supports four organizations aiding women and children - Maison Rose, L'Empire des Enfants, Women of Djenné and the Batonga Foundation. 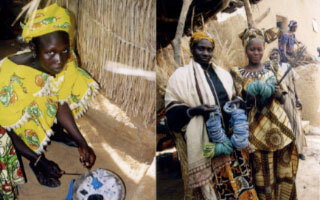 Our African products are made from recycled rubber bracelets made by a Women’s Co-operative in Djenné, Mali. Paid a fair price for their work these bracelets provide the women with a viable means of support and are sold to support L'Empire des Enfants, a school for homeless children in Dakar, Senegal and Maison Rose a home sheltering adolescents, young single mothers and women who have been subject to physical and psychological violence. Throughout Africa the Batonga Foundation, founded by West African singer and Unicef Ambassador Angelique Kidjo, supports secondary school and higher education for girls.